-How did the Russian authorities assess the risk before deciding the strategies of adjustment and response to the disaster? -Describe the range of responses, at the community, national and international levels, during and after the Chernobyl disaster. -How was the response to the Chernobyl disaster affected by individual and community perceptions.? -What factors affected the choice of adjustments before, and responses to the Chernobyl disasters? 1. In which of these events does Syria seem to play a cooperative role with its neighbors or the international community? 3. What patterns are evident in this behavior? 4. Is Syria in a stronger or weaker position now to cooperate with its neighbors and the international community than it was in the 1970s and 80s? 1. 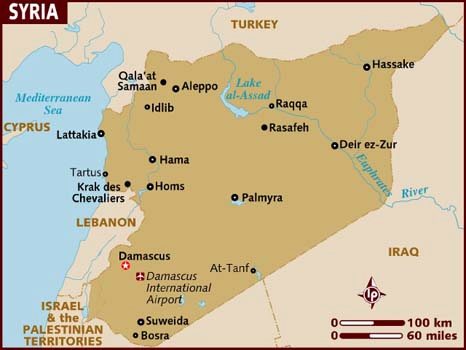 Read Syria’s Role in the Middle East, and answer the questions at the botom of the page. 2. Then, look at the map of the Ottoman Empire on the eve of WWI, and list all the modern countries that were contained in the empire. 3. Next, look at this map on the Picot-Sykes agreement, and list the current Middle East countries the French and British planned to control after WWI. 4. On the blank Map provided, draw in the general area of Greater Syria designed by the General Syrian Congress as described in the reading. How might the implementation of the Sykes-Picot Agreement leave Arabs with bitterness against the West? Why do nations like Syria continue to position themselves in order to create a pan-Arab State? How has western and particularly U.S. support for Israel over Arab interests further aggravated their relationship with Syria and other Arab countries? Since World War II, why haven’t the nations of Syria, Lebanon, Jordan and Iraq been able to unite into a single force? As you watch Episode 1 of the National Geographic series Guns, Germs and Steel, answer the following questions. 1. According to Jared Diamond, what are the three major elements that separate the world’s “haves” from the “have nots”? the film to support Diamond’s theory. 3. For thousands of years, people have been cultivating crops. Describe the process used to domesticate crops and create plants that yielded bigger, tastier harvests. 4. According to Diamond, livestock also plays a significant role in a civilization’s ability to become rich and powerful. How did the domestication of animals help people? Give several examples. 5. List the animals that can be domesticated and where they can be found. 6. Looking at the list of animals and locations from question 5, discuss how Diamond’s theory about geographic luck applies here. 7. How did the movement of the early civilizations of the Fertile Crescent (Middle East) further support Diamond’s idea that geography played a key role in the success of a civilization? 8. Do you agree with Jared Diamond when he says of a civilizations ability to gain power, wealth, and strength, “…what’s far more important is the hand that people have been dealt, the raw materials they’ve had at their disposal.” Why or why not? Anas Al-Abdah, Chairman of the opposition movement for justice and development, member of the secretariat general of the syrian national council. As global and regional powers fight their own battles, will Syria’s revolution succeed before the country falls apart? Once you’ve completed the vocabulary, complete the questions below. Explain why some people are reluctant to arm the Syrian opposition. What is the international community’s position towards Al-Assad’s regime? Why are China and Russia opposed to the UN’s sanctions? Why are people critical of Kofi Annan’s mission in Syria? Why is Iran eager to support the Al-Assad regime? Why is Saudi Arabia opposed to the regime? With what you have learned so far, what solution do you see to ending the conflict in Syria? Create a poster depicting the main features of 2 drought events happening today, or in the past decade. You may chose to use Niger and the US. For a disaster drought event of your choice (You may chose Niger), fill out the google doc, including the discussion questions. Due Tuesday August 28th.